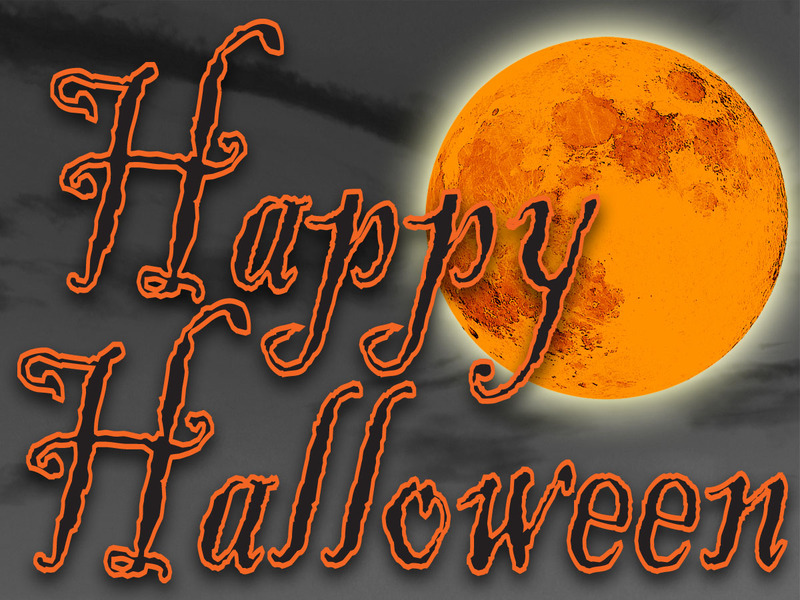 Happy Halloween everyone! This is such a fun holiday for the little ones – cute little kids in warm fuzzy costumes and sleep-deprived parents sporting zombie-like circles under their eyes simply blend in with the crowds. On this first Halloween for the muppets, they will be helping me hand out candy to the slightly larger little ones traversing the neighborhood in search of fun-size goodies. Our celebration was yesterday. With lions and tigers and bears – oh my – a number of moms gathered to watch our progeny dive headfirst into a massive sugar high (and ball pit provided for toddler entertainment). Chaos ensued. There were Buzz Lightyears and Jesse the Toy Story Cowgirl, a skunk, giraffe and butterfly. Sadly, the jovial atmosphere was dampened when Mickey Mouse took a bite out of the bear (literally). The bear spent the rest of the afternoon running amuck in his undies – judging by the pattern on those, I suppose he transformed into a fire truck. But, of course, kings of the jungle were the lion and the mischief-making monkey. Destroy was my little lion and Search was mommy’s monkey. I grew up collecting stuffed animals – I have containers full waiting for the boys and still more stored at GrammaJ and GrampaTavo’s house. Today, my million dollar miracle muppets were by far the cutest and cuddliest stuffed animals to ever exist. 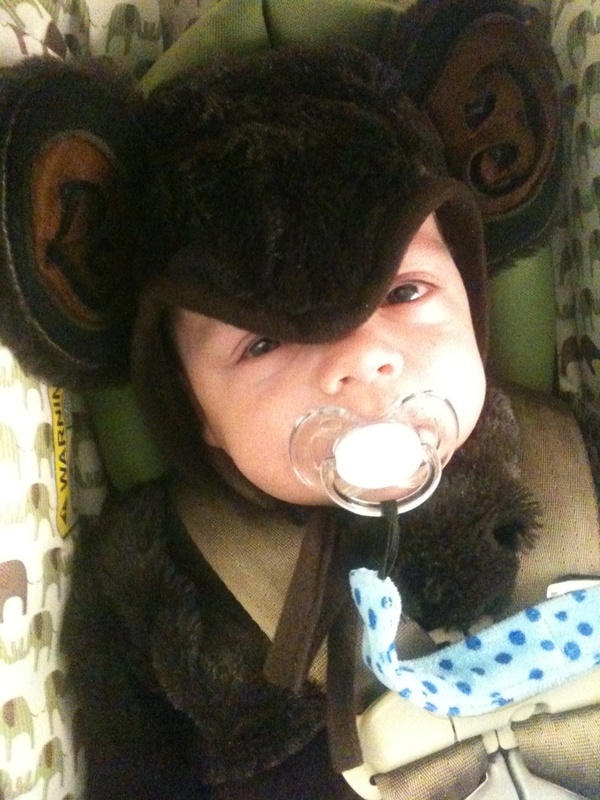 One little boy was wearing an oversized “My First Halloween” onesie. He was one week old. I looked at the tiny man, who weighed in at a hefty seven and a half pounds, and exclaimed, “He’s so tiny!” I had become so used to my little perfect preemies that I hadn’t realized how quickly they were growing up. Not only are the muppets no longer the youngest kids in the crew, they are no longer the smallest! I was thrilled to actually feel a baby (full term) was small. Look how far we’ve come – and that realization was the best “costume” of the day. We’ve all had a great time during our first official kickoff to the 2010 holiday season. And Search thinks this weekend’s adventures have been hilarious. Ok!, I am going to sew them the “greatest muppet caper costumes”. 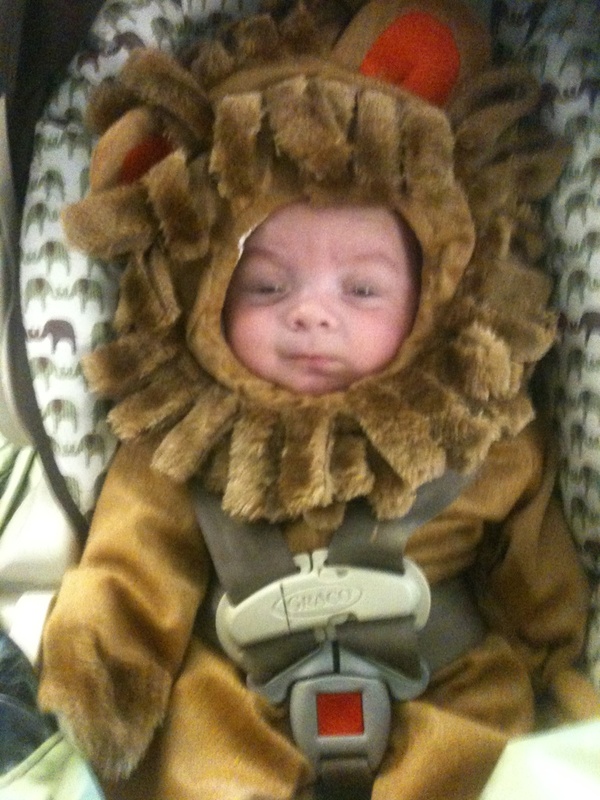 Halloween costumes became my speciality once I had kids, since I didn’t have time to sew anymore. What a wonderful 1st Halloween for the Muppets! 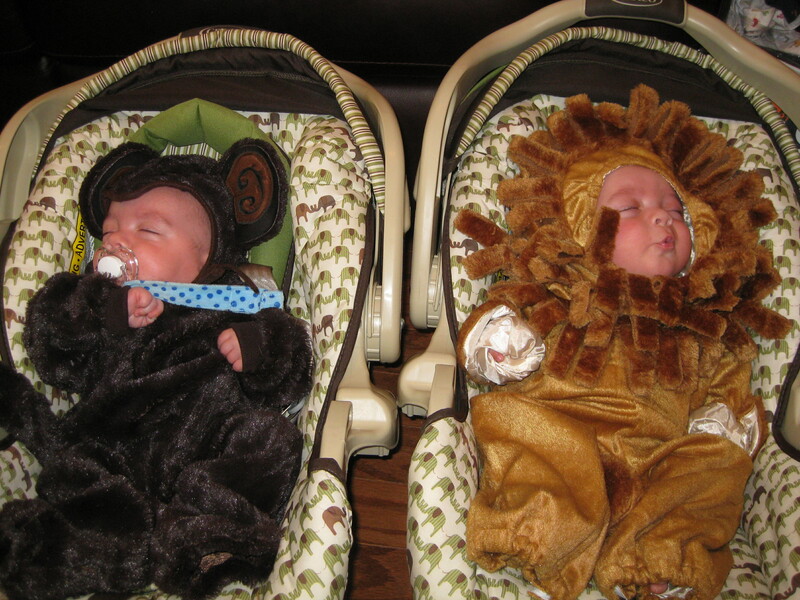 Definitely the cutest lion and monkey on the planet. Hope they stay in the “Muppet Mode” long enough to enjoy whatever creative people can provide for their costumes or whatever. Such fun!!! G.G. I have been waiting to see these pictures ever since you showed me the costumes in the bag! They look really comfy actually (as opposed to my many itchy costumes I endured when I was younger). Great picks!